Do you need a website to showcase your artwork? How about a website without domain registration or web hosting fees? If the answer is yes, Shaw Website Design Group has your canvas prepared with our Artist Template package. This template brings a mobile ready, 24 hour a day store-front studio to aspiring artists who swing a mighty brush and to sculptors who mold powerful visions. One-stop PayPal template account setup that provides credit card ready, customizable transaction pricing online. A fantastic rich snippet template that furnishes search engine results with pricing and images. 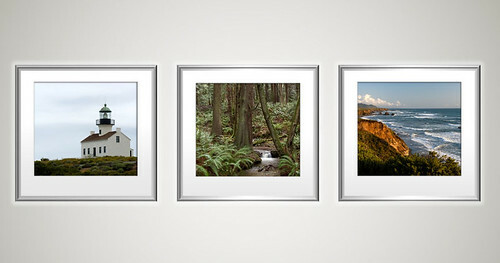 A fully functioning Design Gallery to showcase your artistic works. Establish connections to social networking sites. Regional Directories are made aware of your Artist Template. Social Network Plugins such as Pinterest that allow viewer's the opportunity to instantly upload and share a sample of your artwork. Google author and publisher linkage provides you with authority in search results. You finally control the message, not others. Drive traffic to your message and establish your brand name. Your Jimdo Artist Template is a perfect fit for those designers who need an expandable, affordable, mobile store-front website that is Paypal transaction ready from day one. Jazz up your Artist Template home page with expandable images that delivers a memorial viewing experience. Your Artist template will offer up headlines that touch the readers curiosity and provide solutions to the readers concerns. You can grab hold of your readership with this crisp, clean, mobile ready home page design. Click on the image to return to the artist template gallery. Your Artist about page provides a great place to launch a stunning gallery format of images for the public’s viewing pleasure. Finally your able to bring into focus the artistic work you feel strongly about and deliver a simple to understand, point of sale system. The point of sale system can even provide a linkage to third party viewing or selling or purchasing venues. From images to video, single page to catalog. On-site to third-party venues, the combinations provided are endless. You’re finally in control of a message you can easily adjust to fit market conditions or your creative mood. 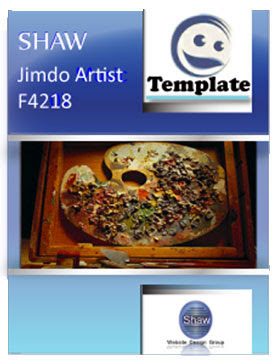 Shaw's Jimdo Artist Theme would not be complete without a fully featured contact page. Shaw's template design provides your viewership with a simple to use, easily adjustable form to submit helpful comments or make requests. If your customers need your location they can be provided with a quick loading, mobile friendly, map image along with your group or organizations physical contact information. Your customers can even pass around to friends your rich snippet calling card that is social media friendly. 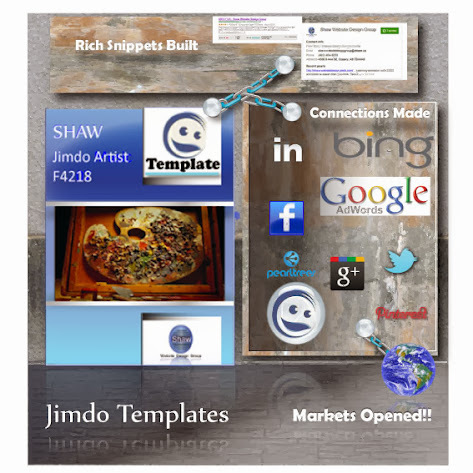 You will quickly find out that your Jimdo Artist Template’s Blog page is your social media connection in building your fan base. Faster than you think, you can post new artistic creations, offer video presentations, provide flyer or catalog updates and tack up upcoming events quickly and easily. Your blogs strong point is in the fact that you are synchronised with your social media accounts and any update is transmitted almost instantaneously. Rest assured your Artist template’s blog page is there to help attract and keep your audience informed with your own personal message. Your Shaw Website Design Group's Artist Template would not be complete without plugins that help you focus your creative message. From image galleries to point of sale plugins Shaw has you covered. The first Jimdo plugin provides your viewers with an excellent Photo gallery montage with timed transitions and user friendly controls. Fully expandable and stackable, this plugin is easy to modify and a breeze to use. Next we have a Jimdo Flicker plugin that offers an album row of images that when selected, will expand to full size for viewing. Many rows can be stacked together to make a library collage that stands out. Show the world your artistic talent with our eye catching Animato plugin. Your YouTube fans can be treated to 30 or 60 second commercial presentations. A simple to create lasting impression awaits your creativity. You can always publish and display your artistic side using our ISSUU plugin. Whether your message needs a flyer, handout, book or catalog, this simple to install widget will help you with your publishing needs. Start your social networking off with a bang by creating and publishing video montages to Vube. Allow your growing fan base to subscribe and share your artistic presentations. Do you want to really increase traffic to your art studio? What you need is a YouTube channel dedicated to your talent. With our Artist YouTube plugin you can quickly and easily share your visual productions with millions of soon to be customers. Our Jimdo Slide Share Plugin provides the perfect venue to tell your story, your way. Direct and produce a slideshow that focuses on your best artistic work. A great plugin that can reach millions of soon to be fans. Placing your artwork in PowerPoint form does have its advantages. Shaw's PowerPoint plugin, built for your Jimdo Artist Template, allows your images to leap out and grab the views attention. Using the rich features of Microsoft's PowerPoint Web App along with Sky drive, you're able to deploy rich animated slides that your viewers will want to see. Finally, here are some great resources your highly expandable Artist Template can link to and utilize. The options are almost endless with Jimdo's powerful framework and our Artist Template's flexibility. Product description: A Jimdo Template for artists, graphic designers,painters, sculptors, sketch artists and art sellers. This Artist template will be developed and synchronized to Google, Bing, Facebook, Twitter, LinkedIn and Email accounts.